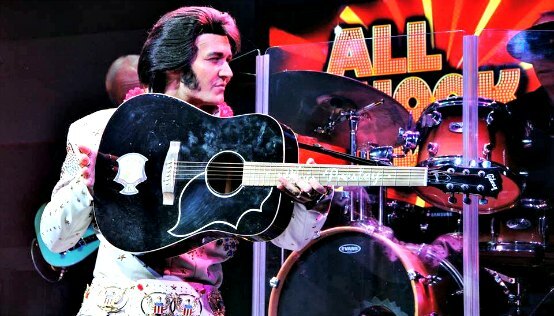 All Shook Up Las Vegas -Tribute To The King - is one of the best Elvis tribute shows playing in the city. 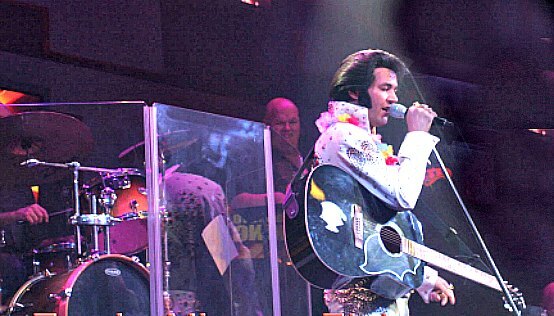 This 75-minute Elvis Presley impersonation show is more than just a tribute concert of the King of Rock and Roll. Produced by David Saxe, All Shook Up is the quintessential Elvis performance that has been named Best Impersonator Show in Las Vegas for 2015. Tribute artist Travis Allen has all the right moves, mannerism of Elvis and his voice is spot on during this tribute show. He is not a novelty act and is very comparable to Elvis’s height as well as weight throughout the King’s career. Allen is joined on stage by a live piece band that propels the evening forward with precision timing and sound on each cover. Allen is masterful with his iconic Elvis moves during his portrayal of the King of Rock and Roll. Allen sashays across the stage while belting out a perfect rendition of Blue Suede Shoes. 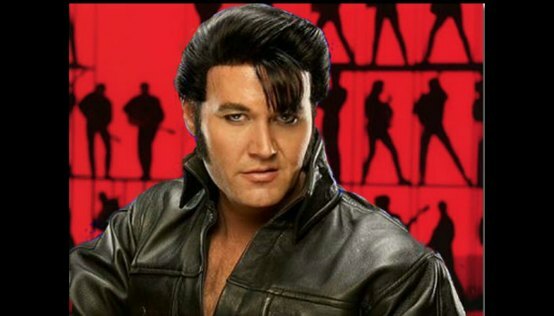 The tribute artist of All Shook Up Las Vegas show is passionate with his cover of Jailhouse Rock, Hound Dog and Allen can really move his hips in tune with the beat while singing All Shook Up. The women in the audience get all choked up during the impersonators crooning of Love Me Tender as well as Heartbreak Hotel. Other fabulous memories of the King of Rock and Roll are played out on stage when the audience is awed by the perfect tone of voice in Suspicious Minds, Burning Love and Hound Dog. Closing the show with a perfect rendition of Blue Hawaii leaves every guest feeling like they are in the South Pacific with Allen handing out scarfs as well as kisses to some of the screaming women in the audience. 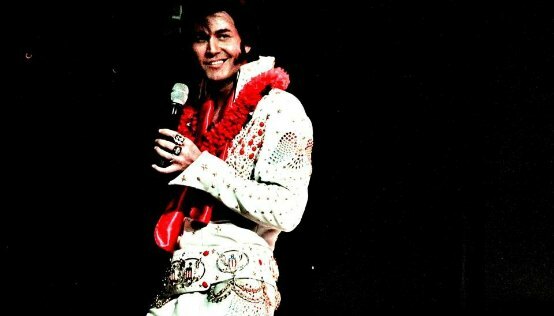 Allen goes farther in being the ideal authentic Elvis by wearing costumes that were made for the King by designer Darlene Thompkins of Blue Hawaii fame. There is one costume change during the show where Allen changes from Elvis’s iconic Gold Lame Dinner Jacket that the performer wore during his early years to the sparkling jump suit that only the King of Rock and Roll wore in his later years on stage. The V Theater is perfect for this tribute performance with intimate seating and a great stage that allows perfect sight views. People in the front row will feel like Elvis is swinging his hips on their lap to the balcony where patrons can take in all the action of the band. No matter if you an old school fan of Elvis or someone younger in age that might not know much about this historic Las Vegas entertainer, the show fits all of these learning curves. All Shook Up Las Vegas audiences thinking they have seen the King of Rock and Roll and the memories of the past are relived with joy. Best seats for All Shook Up Las Vegas: The show is playing at the V Theater which is at the Miracle Mile Shops within the Planet Hollywood Hotel and Casino. The venue can seat around 200 patrons and is a unique venue for this type of show. It's relatively small, so any seat is good. 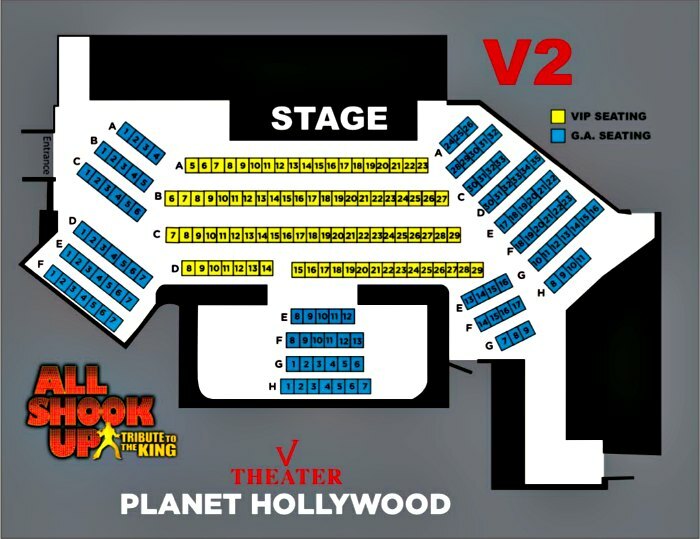 There is limited balcony and general seating with more seating reserved for VIP ticket holders. All Shook Up Las Vegas is produced by David Saxe who has brought such iconic shows as Hitzville, V The Ultimate Variety Show and Vegas! The Show to the world of Las Vegas entertainment. David Saxe is a native of Las Vegas and the spotlight of entertainment on the Strip revolves around his imaginative productions. Travis Allen is the ultimate Elvis Presley impersonator and tribute artist. Allen was born in Corona, California and has been composing as well as playing music since he was five years old. At the age of fourteen Allen formed his first band called the Young Riders. Allen got his break at age fifteen when he attended Star Fest in Pomona, California with Faith Hill and Tim McGraw. One year later Allen found himself with the opportunity of a Nashville recording contract and an offer to tour with Kevin Sharp. Allen declined the contract because of love, and married his girlfriend at a young age. After being laid off as an electrician, his father would give him some advice and $5.00 to enter an Elvis Presley impersonator contest in Orange County. Allen would place in the top three and eventually move to Las Vegas. He has been performing as the King of Rock and Roll for the last four years. Allen has accumulated many awards for his look, mannerism and voice including the Best Impersonator of Las Vegas 2015 by the prestigious Las Vegas Review Journal. Allen also appears on the newest State Farm Insurance commercial as the Elvis with the gold lame. Allen was also the first Elvis impersonator hired for the Cirque du Soleil Elvis show in Las Vegas. All Shook Up show is open to all ages and runs nightly at 6:00 P.M. All Shook Up Las Vegas Tickets are on sale now and range from balcony and general seating to a VIP view of the tribute show.